That’s what it feels like at least. I think I’m already having ancestor withdrawal. What a cool trip. How many times is Mom going to have to drag me somewhere kicking and screaming (Ghana, Williamsburg, etc.) and then me come home LOVING the trip? Then I look like a fool. I hate when that happens. But honestly, it really was awesome. I saw Colonel when we got home and I hugged him so tight. 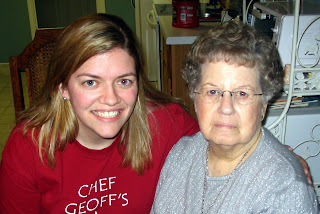 I thought about going to see Ma at the nursing home across the street at 9:30pm tonight. Just to be with her. I’ve been seeing them in pictures from as early at 1913 up until recently (including some awesome ones from the 60s). And to have them so close now it is almost unbelievable. (I don’t feel like this is making any sense, but I’m going to roll with it.) For a week they have been an image alone- like many of the people who are dead now. But to know that there are here, where I can talk to them, touch them, hug them, is amazing me. I told Colonel and all the other family members I’ve emailed or spoken to tonight, “I love you more today than I did last Friday”. And it is true. Even as I was driving to my house tonight, I thought, ‘This isn’t my home. This is a place that makes me live away from my family. I just left home when I left Colonel sitting at the kitchen table, Mom eating dinner, and Sally and Daddy watching TV.’ That’s home. Here are some more pics. Thank you to my friends who are being patient and not giving up on my blog as I post pictures of people you don’t care about so my family can see them. First of all, Colonel is standing in the back. PLEASE check out his hair. That, ladies and gentlemen, explains why my hair does that exact movement every morning. And that explains why Colonel shaves his head now. 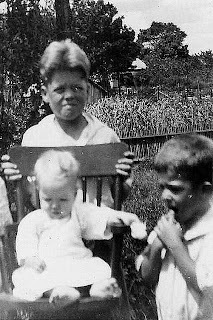 I love so many things about this photo- the high chair, the corn growing in the background, brother James dealing with the cat fur in his mouth, the creative cropping I did to cut out Aunt Mary….. I mean this in all sincerity- I believe one of the great losses in my life is that I did not get to meet this woman- Effie Tatum aka Grandmother. Colonel’s mom. Look at this picture- she means business, but was all loving as well. Amazing. Not a one person we talked to had an unkind thing to say about her. In her lifetime, she had 7 children. 3 died before the age of 3. And I complain about my life? She’s tough. Real tough. And Godly. What is Godly toughness called? Whatever that word is, she is that. In the end, we scanned over 250 images- mostly pictures, but also articles from newspapers, handwritten letters, and report cards (from 1899!). Mom would scan it, then hand it to the Aunt we were with, she would tell the story, and I would type whatever she was saying into my computer. All in all, over 10 pages typed. Good gravy. I hope you get to hug someone in your family today. When push comes to shove, they are the ones God chose to make you and mold you, challenge you and grow you, love you and protect you. They aren’t perfect- none of us are. But they are your’s. You picked your friends- God picked your family. I LOVE what He picked for me.